Welcome back to school! Hope you all had a fun summer. SAFG was busy and would like to share some exciting developments. First, SAFG was invited to the White House Summit on the United State of Women in June 2016 as a “Nominated Change Maker” for our work providing STEM education to elementary-age girls. Courtenay was honored to attend on behalf of SAFG – and what a lineup of speakers! She had the opportunity to hear from President Obama, Joe Biden, Michelle Obama, Oprah Winfrey, Warren Buffet, Nancy Pelosi, Billy Jean King, Patricia Arquette, Marillyn Hewson, etc., as well as the heads of at least 40 different incredible organizations in the US working on initiatives supporting women and girl’s programs in the United States. SAFG was also a part of the vital discussions around strategies to engage more girls in STEM starting in elementary school. This event was inspiring and helped SAFG get on the map as an important part of the movement to prepare our young children with the much-needed skills in STEM to ensure their success in the future. SAFG was also proud to partner with the Lawrence Hall of Science at UC Berkeley on a STEM Summer Library program at 81st Avenue Branch Library and Eastmont Library in Oakland, California. Over 200 girls and boys attended the program and had the opportunity to get very messy making slime (polymers) and making oobleck dance at Eastmont and partake in design challenges at 81st Ave creating cookie packaging that would survive shipment from overseas as well as building bird wings and testing them to see how fast they could fly, among other engaging, hands-on projects. These two libraries were identified by Oakland Public Library's head of children’s education because they were located in areas in need of programs like ours. SAFG also held two weeks of summer camp at Curiosity Hacked in Oakland focusing on Green Playground Design, where girls explored what it means to “be green” through a variety of activities and discussions centered around preserving our planet, energy conservation and material re-use. Their knowledge was applied to a week long project - the design of a custom playground to fit in the back lot of Curiosity Hacked. This project served as a culmination of their sustainability knowledge as they reinforced the steps that make up the Engineering Design Process, incorporating green construction practices and materials. We were so lucky to have amazing role models who worked in sustainable engineering, consulting, architecture and construction visit with our campers. The girls learned concepts like vision boarding and applied this process to their own playground models. They learned about alternative energy and how to build kinetic structures using batteries and wind. They got their hands on real sensors that measured energy consumption and saw how consultants interpret and utilize this data to make buildings more energy efficient. Finally, girls engaged in discussion about how considering the placement of the sun in various seasons impacts where windows are placed and shades are constructed to maximize diffuse heating winter and cooling in the summer. The girls received such rich information that provided real world situations which they can add to their personal experiences as they learn STEM in school. Many thanks, to Megan White of Integral Group, Shiloe Bear of Creek Development, Adhamina Rodriguez of AR Green Consulting, Charlotte Helvestine of Carbon Lighthouse, Kris Klotzbach of Clif Bar and Vanna Whitney of Leddy Maytum Stacy Architects. Scientific Adventures for Girls is thrilled with the financial support it has received this summer. First, Novus, an investment firm, pledged a generous donation to support SAFG as it expands it programs. A huge thanks to Novus! Additionally, SAFG was awarded a grant from the Clif Bar Family Foundation. We are so grateful for Clif Bar for not only its financial support but also for the amazing female engineers who work at Clif Bar. They have volunteered their time to attend our local classes and inspire our girls by exposing them to the practical, socially responsible projects engineering can help to solve! If your company provides small grants to organizations like SAFG, please write to us – we would love to apply! Or if your company's employees advocate for girls in STEM and would like to learn more about SAFG, we would be happy to come speak to your colleagues at a "Brown Bag Lunch Session". Or if you would just like to personally donate and support girls in science, please go to our website here. Every donation counts! Help us reach as many girls as possible in the Bay Area! Stay tuned for another “Go Fund Me” campaign to fund a new program at Martin Luther King Elementary in Oakland, CA! SAFG is so eager to get back to after school programming! This fall's themes are Pow! Bang! Fizz! Science Whizz which will explore what all the commotion is all about! We will make oobleck dance and rockets blast, marshmallows fly and motors whir, make toothpaste for elephants and play dough light up in this hands-on, minds-on exploration of science. Another theme will be Green Design. Girls will learn what is green design and will apply these concepts in their everyday lives. Projects can include constructing their own eco-friendly playground models, surveying water usage at their own schools or building animal habitats for their school environment. Girls will maximize fun while minimizing environmental impact. In all classes, SAFG girls will have the opportunity to meet and chat with female experts in science, technology, engineering and math fields. They will learn first-hand the importance of science and math and how they can be applied to amazing, fun jobs in the future! We are excited to add a brand new site -- Chabot Elementary in Oakland, CA. Please visit our website to see where SAFG is this fall! Collect an assortment of leaves. Then tear up each leaf and place into a mortar and crush the bits to release their juices with a pestle. If you don't have a mortar and pestle put your leaf into a glass and crush them with the back of a spoon. Place each leaf's bits and juices into its own glass and tape a matching leaf to the glass to remember what the original leaf looked like. Next, carefully pour a couple tablespoons of rubbing alcohol into each glass until the crushed leaf bits are covered. Then place the glasses in Pyrex dishes and pour boiling water around (not in!) the glasses to warm up the alcohol. By warming the rubbing alcohol, you speed up the process of drawing the color out of the leaves. You can also cover the glasses with plastic wrap and wait overnight for the pigments to dissolve in the alcohol. After about 30 minutes, you can see how the leaves’ pigments color the alcohol. Cut 1 inch by 5 inch strips from white coffee filters to use as your chromatography paper. Place one end in the solvent (alcohol) and drape the other over the edge of the Pyrex. Do this with each glass. Then you wait! In about one hour or two, you will see something happen! 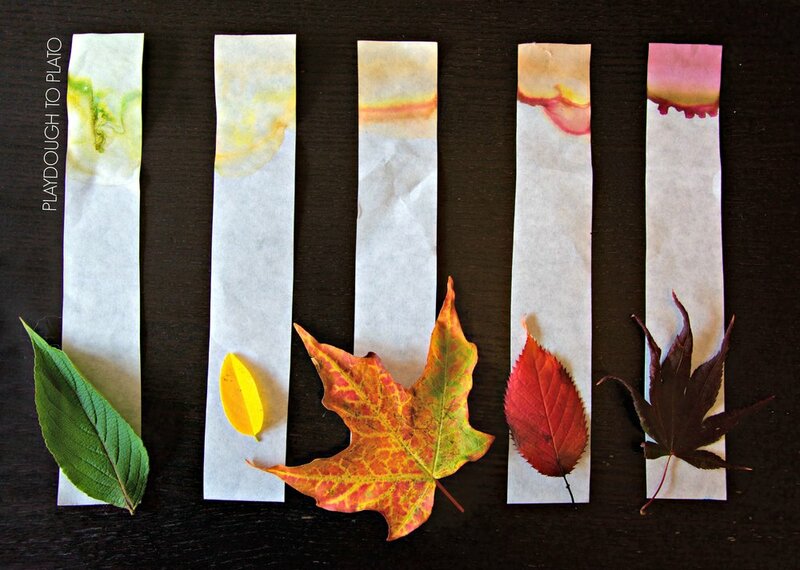 The alcohol carries the pigments from the leaves up the paper and separates them into bands. Photosynthesis is the process in which plants convert light energy from the sun to chemical food energy. To absorb the light, leaves use brightly colored pigments with chlorophyll being the most important one. There are two main types of chlorophyll: chlorophyll A which is bluish-green, and chlorophyll B, which is yellowish-green. During most of the growing season, leaves contain more chlorophyll than any other pigment, making them appear green. In the fall, chlorophyll begins to break down, and the other pigments, which have been there all along, are finally revealed. Yellow leaves have pigments called xanthophyll, orange leaves have a pigment called carotenoids. Anthocyanins, give leaves their intense red and purple pigments. These pigments, however, aren’t present in the leaves during the summer and are only made toward the end of summer. Chromatography, is the separation of a dissolved mixture by passing a through filter paper through which different parts of the mixture will move at different rates. The pigments that were more soluble in the solvent (alcohol) moved further up the paper than the less soluble pigments. Using the green leaf as an example, the blueish-green chlorophyll A was less soluble than the yellowish green chlorophyll B and thus it didn’t move as far up the paper.